I've tried to explain things in terms of what he says directly after this sentence. He's interested in Rome. The narration for the Greek republics is easy because their constitutional histories are clear and the effects of those constitutions, the now infamous rises and falls, are clear. For Rome, the constitution is more complex and historical record is far murkier. Collective fate? Far from it. Perhaps in some of my earlier rejected interpretations, I was saddled with that. But not with my latest proposal. What they share is they provide clear data, more a historiographical matter than a historical one. How many does Aristotle survey? About 150 city-states. And remember Polybius is writing for the folks back home who know quite about the rises and falls of those 150 having had 200 years more than Aristotle to observe and ponder. And he's going to drop the term politeuma and take up the division into democracy, oligarchy and kingship and even expand it. So he certainly doesn't think they have collective fates. I'm still somewhat confused as to how he can talk about them having any independent futures at all given that I think it is post 146. But that is a topic for another thread. -sorry), your adverbial interpretation does now seem to be correct even to me. didn't seem to fit your interpretation but actually it fits rather well. Of the Greek republics, so far as on the one hand (a city) has often risen to greatness and on the other hand often fallen into insignificance, it happens that the narration concerning what has come to pass and the prediction concerning what will come to pass is easy. rising and falling but there is no implication they did it on the same trajectory. Does that sound like it is on the right track? John W. wrote: I think that the use of the definite article in τῶν μὲν γὰρ Ἑλληνικῶν πολιτευμάτων simply means 'Of all the Greek cities ...', of which he then goes on to describe a subset (όσα): it doesn't in my view indicate that the subset itself necessarily comprises all Greek cities. This is certainly the case with another Thucydidean example which I've remembered and which starts with a genitive (1.7): τῶν δὲ πόλεων ὅσαι μὲν νεώτατα ᾠκίσθησαν ... .
Marchant approvingly references Forbes; and Forbes takes up this sentence twice in Vol. II of his commentary on Book I, on p. 14 and p. 149. The whole ὅσαι clause is subordinate to the αἱ δὲ παλαιαί clause that begins four lines later. -Understand Forbes on Th. 1.7. -Understand Smyth 2532 on Th. 2.96. I cannot work out the uncontracted version, nor can I explain how the preceding osa item on Th. 2.96 differs or fails to differ. I believe that the reason for a singular verb is the neuter plural which regularly takes a sg. verb. But I like your explanation. Re: Plb. 6.3: viva ὅσα! Looks like I'm going to be claiming that Forbes and Marchant have got Th. 1.7 wrong. Forbes just thinks he can take ὅσαι to mean "only" and get away with it?! Not while I'm around he can't! Hobbes is on the right track with his "inasmuch". More to come. NateD26 wrote: I believe that the reason for a singular verb is the neuter plural which regularly takes a sg. verb. I do recall talk of neuter plurals but it has yet to really sink in. Thanks for putting me right. have ended up in accidents. In Greek things are easier because there is a pronoun implicit in the verb. καὶ μέχρι τοῦδε ἔτι ἀνῳκισμένοι εἰσίν. and up till this time they remain there. ὅσος preceded by an Adjective.—Here the subject of the relative clause is identical with that of the main clause, and is omitted together with the copula: χρήματα ἔλαβε θαυμαστὰ ὅσα (for θαυμαστόν ἐστιν ὅσα) he received a wonderful amount of money P. Hipp. M. 282c, μετὰ ἱδρῶτος θαυμαστοῦ ὅσου (for θαυμαστόν ἐστιν μεθ' ὅσου) with an astonishing amount of sweat P. R. 350d. So θαυμασίως ὡς (for θαυμαστόν ἐστιν ὡς) P. Ph. 92a. What does he mean by subject here? He can't really be talking about the grammatical subject of the main clause can he? I'm not sure he's even talking about nouns. χρήματα ἔλαβε θαυμαστὰ for χρήματα ἔλαβε θαυμαστὰ θαυμαστόν ἐστιν ὅσα? I'm completely confused. Can somebody give me the full forms for these two examples? Last edited by pster on Mon Jan 21, 2013 4:38 am, edited 1 time in total. reads it as perfectly active. A sum of money was received which was of wonderful amount (of money). money was suddenly turned to a sg. adjective in the pre-attraction sentence? If you check the index, he doesn't list it under Inverse Attraction there. My sense was that it was an independent section. Now that I think about it, I guess that commits me to the view that it is neither attraction nor attraction? It really is quite the mind bender. -I don't think by "subject" he means grammatical subject. I think he just means substantive/noun. The second example doesn't even have a main clause subject. -If you could figure out how you could have a singular adjective with plural noun, I could probably cook something up for the rest of it. -I would like to read it something along the lines of "He had so much money, as much money as is wonderous." But the singular stuff blocks that. -The fact that both examples use thaumasta is really annoying. I wonder if impersonal expressions are in play? Unless you can explain the arrival of singular adjectives, I am probably going to claim that Smyth is wrong here. He is wrong because his expanded versions are strange and he is wrong because his explanation is defective. The second one expanded would be in English: with so much sweat, as much sweat as is astonishing. Smyth's μεθ' ὅσου seems like the most bizarre moment of the entire thing. Is there a better grammar than Smyth? Something in German maybe? pster wrote: Unless you can explain the arrival of singular adjectives, I am probably going to claim that Smyth is wrong here. He is wrong because his expanded versions are strange and he is wrong because his explanation is defective. but your English rendering inserts an implied τοσοῦτον. Is it common to omit it? 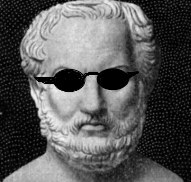 If you look at all my recent posts, the absence of τοσοῦτον is central to my understanding of what is going on. τοσοῦτον=so many. But it is often absent in Greek just as in English. We can say: I gave him so many reasons not to do it, as many as I could think of. But we can also say: I gave him reasons not to do it, as many as I could think of. Both are perfectly good English. My controlling assumption with all of these osos expressions is that the best way to grasp what is being said is to insert a demonstrative τοσοῦτον by hand. I think Hobbes recognizes this when he employs "insofar as" in his translation of Th. 1.7. τοσοῦτον is not there in the Greek. But this is more of a method than just inserting an implied copula. Whether the τοσοῦτον is implied or not is much more complicated an issue. It's not implied as much as the copula because you can put other things there. So: I gave him a dozen reasons, as many as I could think of. Frankly, I just simply don't think that Forbes or Marchant fully understand the nature of osos. I don't usually think scholars have made big mistakes, but I have studied enough things to know that every year or two you actually catch them tripping up. Hobbes seems to understand it. I think LSJ probably do. So what about Smyth? Well, I'm not sure exactly yet what to say. I was trying to build some drama by saying I think he is quite possibly wrong. I have no idea how he gets the singular involved. You and I both have studied this singular prediate with neuter plural subject. Just above you point it out to Daivid. But what Smyth is doing here seems unprecidented and rather bizarre. On the other hand, what he is doing is so bizarre that it does seem that he maybe he knows something we don't. Looking into the mist I think maybe he gets driven to some weird singular formulations because he doesn't actually understand osos. But where is he getting the singular from?? I'm really getting annoyed with this because I have already put Smyth's 2532 aside because of difficulties. There he doesn't even want to give his uncontracted version for the Thucydides quote. Maybe I'll have to open it up to a forum wide brainstorm. Last edited by pster on Tue Jan 22, 2013 5:32 pm, edited 2 times in total. pster wrote: If you look at all my recent posts, the absence of τοσοῦτον is central to my understanding of what is going on. τοσοῦτον=so many. But it is often absent in Greek just as in English. Both are perfectly good English. My controlling assumption with all of these osos expressions is that the best way to grasp what is being said is to insert a demonstrative τοσοῦτον by hand. I think Hobbes recognizes this when he employs "insofar" in his translation of Th. 1.7. τοσοῦτον is not there in the Greek. But this is more of a method than just inserting and implied copula. Whether the τοσοῦτον is implied or not is much more complicated an issue. It's not implied as much as the copula because you can put other things there. Interesting approach. I'll have to look at it in detail later. pster wrote: So what about Smyth? Well, I'm not sure exactly yet what to say. I was trying to build some drama by saying I think he is quite possibly wrong. I have no idea how he gets the singular involved. You and I both have studied this singular prediate with neuter plural subject. Just above you point it out to Daivid. But what Smyth is doing here seems unprecidented and rather bizarre. On the other hand, what he is doing is so bizarre that it does seem that he maybe he knows something we don't. Looking into the mist I think maybe he gets driven to some weird singular formulations because he doesn't actually understand osos. But where is he getting the singular from?? adjectival but it is also part verbal?" I don't think he's ever given me an answer for it. No, we are on the same page. I edited my comments. You can have plural neuter subject with a singular verb or you can have neuter plural subject with a singular copula with a plural predicate adjective/noun. But not what Smyth has in his first example. I am going to take more time with the loose ends than I anticipated. So it may be a week before I put post my view of what is going on. In the meantime, here are some other places where one or the other of the expressions occurs, some places where commentators have seemed to assert that the expressions are interchangeable, a view I do not hold, and Dion. Hal. who uses/mentions it.